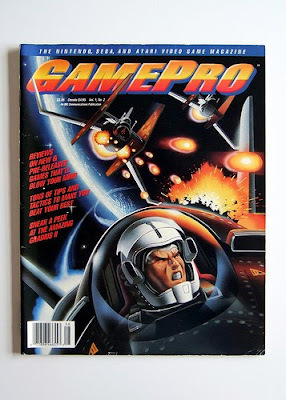 A few weeks ago, someone contacted me via flickr and asked if I'd be willing to sell my copy of GamePro magazine's second issue (below). I declined, although I'm not entirely sure why. After all, I rarely flip through that particular magazine, and I'm not saving it so I can sell it for more money at some later date. It's a good thing I'm not holding out for bigger bucks, because according to this gamasutra.com article--penned by Kevin Gifford, author of one of my favorite gaming sites, magweasel.com--such a tactic is unlikely to be successful. By the way, if you'd like to flip through issues of old gaming magazines without dropping a single dime on them, check out old-computer-mags.com and retromags.com. Sweet! Thanks! I might check that out! Unfortunately, both sites are still a little light on content, but hopefully that will change with time.